Balasore, February 20: Today nuclear capable Agni-II Ballistic Missile was successfully test fired from Abdul Kalam Island off Odisha coast. The two-stage solid propelled Agni-II is one of the key weapon systems of India and had already been inducted into the armed forces since 2004. 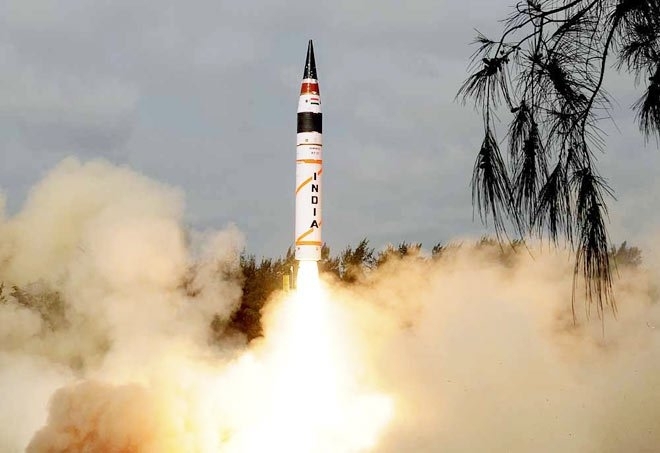 Agni-II Ballistic Missile was successfully test-fired at 8.39 am today. The missile has a strike range of 2000 km. The trial was conducted by the Strategic Forces Command (SFC) of Indian Army as part of user training exercise, said Defence sources. Both stages of the missile have a solid propulsion system, which allows the missile to be mobile and flexible. It is 21 metres tall and is capable of carrying a payload of one tonne. It has appropriate onboard thrusters fitted on the second stage. The Agni-II is designed to be launched from a rail-mobile launcher and it is also available in road-mobile configuration. This lends flexibility to the weapon system and reduces vulnerability to the first strike. The two-stage missile equipped with advanced high accuracy navigation system, guided by a novel scheme of state of the art command and control system was propelled by the solid rocket propellant system. The surface-to-surface missile can carry a nuclear payload of 1000 kg. The range of the 20-metre long missile weighing 17 tonnes can also be increased to 3000 km by reducing the payload.